How can we bridge the gap between projected investments in infrastructure and what we actually need? The leaders of the international community will gather in Washington DC this week to assess the state of global development. 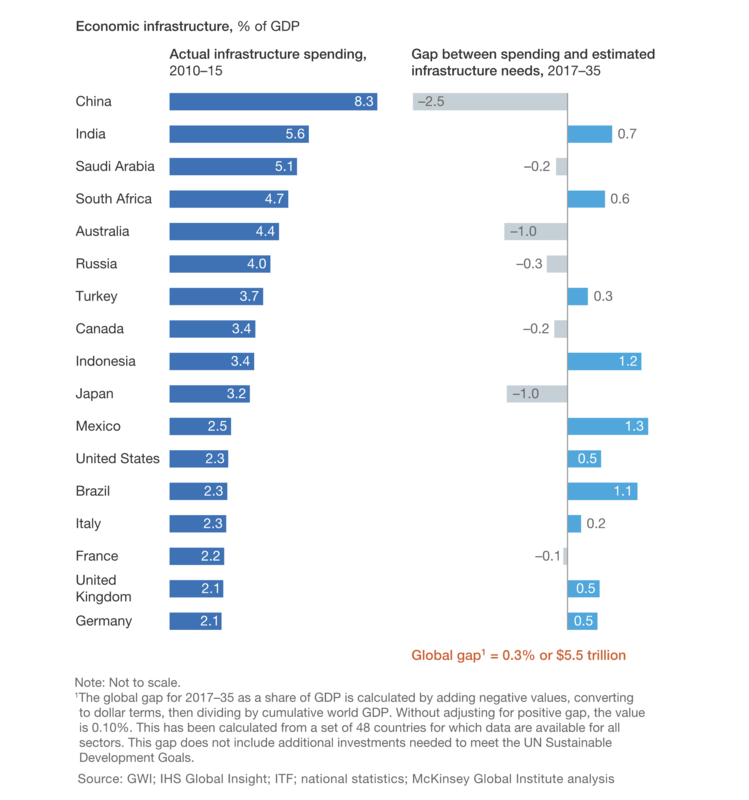 High on their list will be catalysing greater investment in global infrastructure - unsurprising given that infrastructure can be an enormous economic multiplier, providing dividends for an economy long after the initial project is finished. New roads can slash delivery time for goods, lowering costs for consumers and speeding through the exports that fuel growth. New seaports can connect an economy to the world, increasing competitiveness and raising the national standard of living. Such examples are plentiful. Why then, according to the Global Infrastructure Hub, will the world be facing a $15 trillion gap between projected investment and the amount needed to provide adequate global infrastructure by 2040? From corruption to overbearing bureaucracy to under-skilled labour forces, there are many answers to this question. However, alongside the meetings of the World Bank and the International Monetary Fund, the World Economic Forum’s Global Future Council (GFC) on Infrastructure is also convening in Washington DC this week to focus on solving global challenges. By the end of their one-year term, the council hopes to cross two of these reasons off the list: the lack of investable project pipelines, and the low level of technological innovation in infrastructure systems. Private investment is a well-trodden path for financing infrastructure development. With government funds increasingly squeezed to pay for things like healthcare, education and pension obligations, turning to the private sector to fund some infrastructure projects will be essential, now more than ever. This has been a near consensus opinion among development institutions since at least 2015 - when the UN released its Addis Ababa Action Agenda, which emphasised the importance of blending public with private capital to fund development, including infrastructure. Private investors, however, are often unable to commit the capital required because governments have often been unable to create investment-ready project pipelines (a series of infrastructure projects presented in a programmatic way) - leaving investors unsure of how, where and when to commit capital. The inability to draw in private capital exacerbates infrastructure shortages and strangles growth potential. This is a long-running issue, and international organizations, multilateral development banks and governments have designed a variety of tools aimed at different parts of the project preparation process and for the use of different decision-makers with the aim of improving project pipelines and attracting investment. However, as the GFC on Infrastructure noted when it met for an intensive two-day meeting at the Annual Meeting of the Global Future Councils in Dubai in November 2018, there is a general lack of knowledge about the wide array of tools available - even among longstanding practitioners in the field. Additionally, those tools that are available lack two key aspects: A design aimed at high-level decision-makers, and secondly a neutral approach towards the full policy spectrum of funding options, from 100% public funding to public-private partnerships. To remedy this, the GFC is taking two approaches. First, they will map the existing landscape of project preparation tools, providing descriptions of how, and who, they help structure projects, and illustrating their real-world utility with case studies. Second, the GFC will introduce the framework for a new tool that builds on existing work but addresses the need for a more high-level, unbiased approach. By compiling these tools, and adding the framework for another one, the GFC hopes to publicise and more widely disseminate existing efforts to help build investable project pipelines, while adding some final pieces to the puzzle. Creating investable project pipelines will greatly increase the ability of the private sector to invest in infrastructure projects around the world and help close the widening global infrastructure investment gap. Infrastructure systems remain among the least digitally transformed in the entire global economy. Many modern infrastructure assets have been designed, built, operated and maintained in much the same way for decades, despite enormous strides in innovation across sectors. This, however, does not mean that technology that can improve the planning, performance and provision of infrastructure does not exist. There is in fact a myriad of exciting innovations already taking place at all stages of infrastructure development and delivery. The main barrier to their widespread adoption is often the lack of an enabling environment from governments, who are generally loath to risk experimenting with assets as economically and politically important as infrastructure, as well as an uncertainty around how to improve the commercial viability of emerging technology. This is certainly understandable; why risk millions, sometimes billions, of dollars and many years on something relatively unproven? This was the second major question confronting the GFC in Dubai, and the Council answered it by having a deep discussion on how best to encourage the embrace of technology in infrastructure. Can digital securities fund an $18 trillion infrastructure gap? Why is private investment in public infrastructure declining? The GFC formulated four big questions centred around capturing data for project prioritisation and decision-making, encouraging disruption in the field while maintaining quality, creating government frameworks that encourage exchange and designing viable commercial models with new policy and regulatory frameworks. The group will compile a book of case studies that examine best, and worst, practices around integrating new innovations into infrastructure development. These cases illustrate real-world examples, rather than simply list recommendations, to give decision-makers practical guidance that they can adapt to their own situations while giving them the freedom to innovate according to their needs. Embracing innovation increases efficiency and quality, while reducing errors, delays, and costs. Better integration of new technology into infrastructure development could result in more widely available, sustainable and efficient infrastructure. Global infrastructure needs are daunting, particularly when contextualised against anxiety-inducing issues like strained government budgets, and even existential threats like climate change. Creating investable project pipelines and speeding the technological advancement of infrastructure development will not solve all the problems inhibiting infrastructure development - but they can provide some important solutions, and help create a more connected, prosperous and sustainable world.